The HTC One mini 2 runs on a midrange Snapdragon 400 chipset with 1 GB of RAM, a quad-core processor with four Cortex-A7 cores clocked at 1.2 GHz each. Cortex-A7 runs very close to its predecessor Cortex-A9 which was all the rage in devices like the Samsung Galaxy S III, HTC One X and others. Despite being close in terms of performance the Cortex-A7 cores consume much less power. The GPU is an Adreno 305. In retrospect the HTC One mini rocked a Snapdragon 400 with a dual-core Krait processor clocked at 1.4 GHz. Since the One mini of old uses a Krait core and not a Cortex core it is more powerful but in turn consumes more power. Other than that, both phones have the same Adreno 305 GPU and the same 1 GB RAM. The screen is also the same 720p resolution so performance numbers will come down to the different CPU architecture. We'll see whether two more cores at a lower maximum clock speed can do more than before. Let's jump straight into the tests. GeekBench 3 and AnTuTu 4 are benchmarks, which put to the test the hardware combo inside the smartphone. GeekBench 3 is more CPU-intensive, whereas AnTuTu 4 is a compound benchmark - testing CPU, GPU, memory performance, etc. The HTC One mini 2 was able to pump out a good score in both. It managed to outdo the LG G2 mini, which has the same hardware as well as the Motorola Moto G. The HTC One mini from a year ago was also no match for the One mini 2. Basemark OS II is another all-round benchmark. It gives an overall score along with single, multi-core performance, math performance and more. We focus on the overall and CPU scores. The HTC One mini 2 got very similar results in both the regular and anti-cheat tests. Just as expected for its midrange position, looking at all the tests, the results weren't very good. And that's not comparing the One mini 2 to the best smartphones out there. It didn't manage to outperform the HTC Desire 816, which has almost the same innards. Next up we have GFXBench's 2.7 T-Rex and 3.0 Manhattan. In 1080p offscreen mode the GPU is tasked with performing graphical computations in 1920 x 1080px resolution, while the onscreen mode uses the screen's native 1280 x 720px resolution. T-Rex, which is the older of the two, poses less demanding tests and here the HTC One mini 2 posted an equal result to the LG G2 mini's and a better one than the Moto G's and HTC One mini's. In the T-Rex onscreen test framerate doubles to 11 fps but sits behind a great 14.9 fps effort by the LG G2 mini. However both remain unusable and stuttery - anything below 30 fps is laggy. The more-demanding Manhattan shows a significant drop in framerate. The HTC One mini 2 posted the same score as the HTC Desire 816 we reviewed recently, which makes sense given that both carry the same chipset and screen resolution with the only exception being a slight RAM increase in favor of the Desire 816. The HTC One mini 2 is a good performer as far as quad-core Snapdragon 400's go. It didn't get passed by its peers like the Moto G or LG G2 mini. But synthetic benchmarks aside, you should know that things load fast and the OS runs smooth. Android 4.1 Jelly Bean saw performance rise tremendously and 4.3 Jelly Bean and 4.4 KitKat added subtle improvements. The current state of Android allows the HTC One mini 2 to offer commendable user experience. 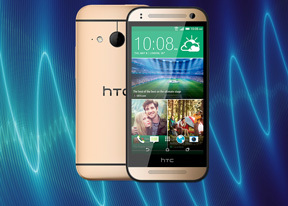 Still, we feel that for this steep asking price, HTC should have bundled it with a more premium chipset.